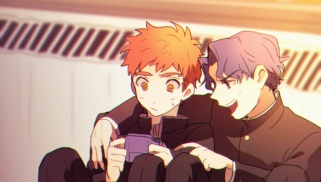 Hey guys, I was wondering- other than Rin's major reason for liking Shirou what other reasons do you think contribute? Also do you think she would still like him if some of his traits were missing? What if he didn't have his signature six-pack? I don't think Rin likes him only for that, but I wonder if having it gone would make a difference? This may be a silly question I'm just legitimately curious on others thoughts lol. I mean in universe Shirou is kinda the plain protagonist. The guy with looks is Shinji and maybe Issei. Everything begins with a bar. I mean in universe Shirou is kinda the plain protagonist. The guy with looks is...maybe Issei. Rin is secretly also a big fan of swords. Well, for one, Shirou is a magus, which means he's one of a very few people she can actually let her "honor student" persona drop around. Ignoring Shinji (who, while "in the know" isn't really a magus) the only other one of those in the entire city is Kirei. Shinji was the one dragging around two girls wherever you saw him. Since we know what his brains were like, he's either a lot more handsome than the artist gave him credit for,or hung like a horse greatly gifted in other ways. Shirou is a Pretty Cool Guy. Eh has Swords and doesn't afraid of anything. I know Shinji is handsome. It's Shirou having apparently plain looks, and Issei being more handsome than him that raises my eyebrows. I mean Shirou doesn't have plain looks going by art, it's just thats his rep in the VN itself. Or how i think of it. Shirou is kinda in background for his school life, which doesn't necessarily have to do with his appearance but with his personality. That's why i mentioned it because of how Shirou is Tohsaka doesn't like him because whether he's handsome or not because normally students wouldn't notice if he's there or not as he's going around doing stuff for people, so thus what Tohsaka likes about him has to do with other things then looks. True, those are good points- Letting her facade down would be a major selling point. So the attraction stems more from the personality rather than appearance, right? If we do say that Shirou attracts Rin because of personality and not looks, would she loose attraction if he didn’t have his six pack? It seems to be one of his defining characteristics. I mean he has it because he’s fit, but if Rin truly likes him for him she wouldn’t care that it’s not there right? He’d still be fit. Last edited by Fatesshadow; May 25th, 2018 at 10:16 AM. Plenty people notice him though. Mostly when he has food. Last edited by Kotonoha; May 25th, 2018 at 10:31 AM. True, those are good points- Letting her facade down would be a major selling point. So the attraction stems more from the personality rather than appearance, right?If we do say that Shirou attracts Rin because of personality and not looks, would she loose attraction if he didn’t have his six pack? It seems to be one of his defining characteristics. I mean he has it because he’s fit, but if Rin truly likes him for him she wouldn’t care that it’s not there right? He’d still be fit. ...Why are you so obsessed with Shirou's abs? It's been a while, but I don't think Issei's popularity or lack thereof was ever mentioned. Just that he's always stuck in the Student Council room doing Student Council things. it's not like he cooks for his school tho, so he remains unpopular since no one knows the heaven that is his kitchen. But that's another trait separate from appearance anyhow. Why would you not be, did you see Presage Flower? Issei, who is organizing the papers he was reading, is the big boss of this student council room. He's the guy trying his best to reform this lax student council, and he's been a friend of mine since first year. His full name is Ryudou Issei. Despite his old-fashioned name, he has elegant features and he's really popular with the girls. Last edited by forumghost; May 25th, 2018 at 10:50 AM.